Logistics is the term that surfaces in almost every discussion of workforce development in southeast Georgia. Finding a way to make money and create jobs from the act of moving goods is an ever-growing factor in the region, home to the state’s two deepwater ports. The ports are in on the game in a new and innovative way, but even smaller inland counties have figured out how to cash in on cargo. 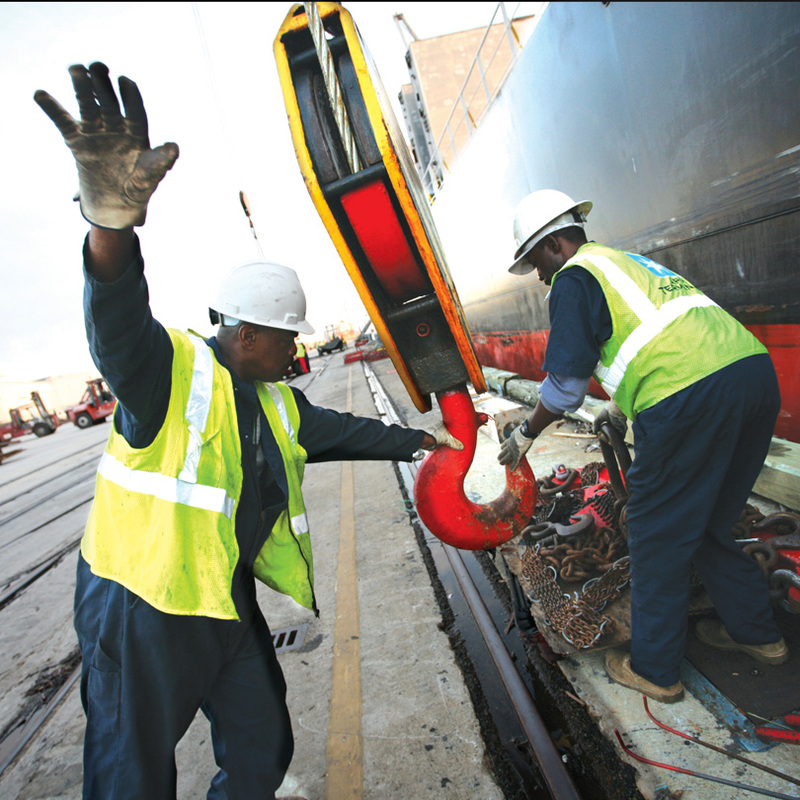 The Georgia Ports Authority’s (GPA) newest effort in workforce development is the YES Program, an articulation arrangement with Savannah-Chatham County public schools that enables young people to step into jobs at the Port of Savannah directly after high school graduation. It started small last year, with six high school senior participants, but the port is committed to growing it and to convincing other industries to consider similar initiatives. The program moves a population with limited prospects – high school graduates with no technical college or other additional education – into sustainable jobs at competitive wages with lifelong career potential. Meanwhile, Georgia’s ports continue to set – then break – new volume records, and that appetite for long-range, high-dollar expansion continues. Projects often hum along in the background, like the $126.7-million Mason Mega Rail Terminal, two years in with a year to go, which will double the Savannah facilities’ already considerable rail capacity. But look for a higher-profile project (or maybe a far lower one) when it comes to the Talmadge Bridge over the Savannah River, which stands be- tween the Atlantic Ocean and Savannah’s container port. It was replaced in 1991 to the tune of $71 million to accommodate the larger clearance required by the latest generation of container vessels. This fall, ports officials sounded the alarm that, as ever-larger ships hit the seas, bridge clearance could once again be an issue 10 years down the road. The solution may be to build higher still – or to dig deeper. The $1-billion harbor deepening project in the Savannah River is about halfway complete, aiming for a 2021 finish. Among the bridge solution ideas that have been floated is a tunnel rather than a bridge. The Georgia Department of Transportation is studying all the options, with GPA picking up the tab. “We’re not asking for money, just your patience as we look at this. It will help identify alternatives and costs and the best way forward,” says James Allgood, GPA chair. Sixty miles away from the docks, the drive for ports jobs is still on. Ogeechee Technical College is constructing a commercial driver’s license (CDL) training range on five acres donated by Screven County. “We have a four-lane connection to the Port of Savannah, so lots of trucks come through Screven County via that, and we want to get some of those jobs for our people,” says Dorie Bacon, Screven County Development Authority executive director. In Liberty County’s Hinesville, home to the sprawling Fort Stewart army base, 300 people per month exit the military, most of them looking for new jobs. Those new civilians fall into two distinct groups, says Ronald Tolley, CEO of the Liberty County Development Authority – those in their early 20s exiting after their first tour of duty, and those in their late 30s, wrapping up full military careers. They become prime workforce assets for industry because they are all experienced in working with teams, he says. “Many are trained in logistics, and logistics are very important in this area. They get snapped up pretty quickly when they’re trained in logistics,” Tolley says. And for those who aren’t? Tolley says the newly consolidated Liberty County campus, once part of Armstrong State University, which in 2018 rolled into the larger Georgia Southern University, has become a stronger asset. “One of the things they have said they intend to do is make things more accessible for the military and military families. As grateful as we were for Armstrong and as wonderful as they were to work with, Georgia Southern is just significantly larger and can offer so many more options,” he says. In Camden County, home of Naval Submarine Base Kings Bay, the latest of the multiple campuses of Coastal Pines Technical College (CPTC) will be built just off I-95 near Kingsland. “It took nine years of advocacy and lobbying on behalf of the chamber of commerce and our development authority,” says James Coughlin, Camden County Joint Development Authority executive director, of the project. The college’s naval apprenticeship program, already in place, holds particular appeal for contractors, he says. Up the coast, Ryan Moore, president of the Brunswick-Glynn County Development Authority, likes to talk about aviation, one of his county’s prime recruitment targets. That’s in large part due to the presence of Gulfstream Aerospace. The company opened a new maintenance repair and overhaul facility in December, its third facility at the Brunswick Golden Isles Airport. With new dual enrollment possibilities between CPTC and a local charter school, Moore foresees a workforce development campus on site in an industrial park across from the airport. Film has become big business in Savannah, second only to Atlanta in the state for the scope of movie and TV projects. Helping the area tap into the talent infrastructure needed to sustain that business is Savannah Technical College’s access to the Georgia Film Academy for training in behind-the-camera careers. But Savannah has taken workforce development a step further – the Savannah Economic Development Authority’s (SEDA) local production incentives, renewed this fall for three more years, include relocation bonuses for experienced movie crewmembers, in addition to incentives for the productions themselves. The incentives are working: the 2018 economic impact of movie and TV projects in Savannah was $253.6 million, up from $137.9 million just the year before. Those incentives can apply within a 60-mile radius from Savannah City Hall, making this a regional effort that reaches not only Savannah’s Chatham County but into 11 surrounding counties. Over in Ware County, Jana Dyke, executive director of the Waycross and Ware County Development Authority, is excited about Ware Worx, a collaborative program that pulls together CPTC, South Georgia State College and local high schools. “We have teachers who are doing field trips to industry all across our community. We have people begging to be a part of this group,” Dyke says. Among the components: Ware County Interview Day, where every high school senior gets real-world practice with resumes and interviews. She’s convinced the jobs will be there when the students are ready, citing as examples an $18-million expansion project that broke ground last year to extend GATX’s railcar cleaning facility and Baily International, a new egg roll production facility that opened in 2018 in a building that had been shuttered for several years. Dale Atkins, executive director of the Appling County Development Authority, says this largely rural county added 200 jobs last year and is honing its workforce development with coordination between the school system and the technical college. Much of the success from 2018 was in growth of existing small industries, he says, like Matrix Cabinets, which imported and distributed cabinets for some 28,000 homes around the country last year. With an economy that’s humming along, it seems that everybody in Southeast Georgia is getting in on the workforce development act. Scott Rainwater learned to appreciate the value of education in his 26 years in the Georgia Army National Guard, retiring as a command sergeant major. As the new general manager of Clayton Waycross Home Building Facility, he’s brought the importance of education to his civilian job, where he spearheaded his company’s purchase of 3-D printers in support of the STEM program at all Ware County schools. As a 2018 transplant from Atlanta and self-described “recovering entrepreneur,” don’t tell Jennifer Bonnett she’s moved to “Slowvannah.” In her first 60 days as executive director of the Creative Coast, a nonprofit organization that supports innovators, she interviewed 90 entrepreneurs. She also serves as the Savannah Economic Development Authority’s vice president of innovation and entrepreneurship. • The Georgia Ports Authority’s $1-billion, multi-year Savannah harbor deepening project is now about halfway finished, with a 2021 projected completion date. • The GPA is also expanding the Port of Brunswick’s capacity to handle auto imports and exports from 800,000 units per year to 1.5 million units. • Internet behemoth Wayfair, which sells home goods, will build a 1.1-million-square-foot facility in Savannah that will call for a $45-million investment over the next five years and create 1,000 jobs. • Two projects bookend Savannah’s River Street. Due for completion this year at the western end is the $275-million Plant Riverside District redevelopment, a cluster of hotels, restaurants and entertainment space. At the other end, the Eastern Wharf is a $225-million hotel, residential, office space and commercial project that broke ground late last year. • The Wharf at St. Marys, a mixed-use marina, light industrial, commercial and residential complex with a combined total public-private investment of $55 million, has cleared the permitting stage in Camden County.